Now that Will Forte has proven his lead actor abilities in Nebraska and The LEGO Movie – yeah, it counts – he can conquer the small screen again for his first major project post-SNL, Fox’s The Last Man on Earth. We can’t wait for this one, and this gung ho trailer championing Forte’s skills just makes us want to dive in (that booze pool) even more. We’re not quite sure yet why Forte’s Phil Miller is the last man on the planet in 2022, as the population-eradicating catastrophe has been largely kept out of the marketing. What we’ve been getting is Phil doing the kinds of things that can only be done in an open world without repercussions. Like a video game with pain involved. And this trailer sums that feeling up perfectly, and makes me wonder if this show will be less about plot and more about living vicariously through this character. I’ll take either charge. Want to steal a bunch of cool art from giant houses? Phil can. Want to build a giant Jenga tower just to knock it to pieces with a bat signed by Babe Ruth? Phil can. Want to send one car into another car just to watch it explode? Phil can. I’d rather not know which of you would take pleasure in heavy petting with mannequins. I already assume it’s most of you. Forte is reteaming with LEGO Movie writer/directors Phil Lord and Chris Miller for this project, as they’re on board as first-episode directors and executive producers. All three of them have unique sense of humor and energies that really make The Last Man on Earth look like an unexpected gem in Fox’s comedy line-up. Here’s the new poster that came out around the same time as the trailer, via TV Line. It’s also pretty clever, and makes one wonder why he used so many staples. Oh yeah, because he can. 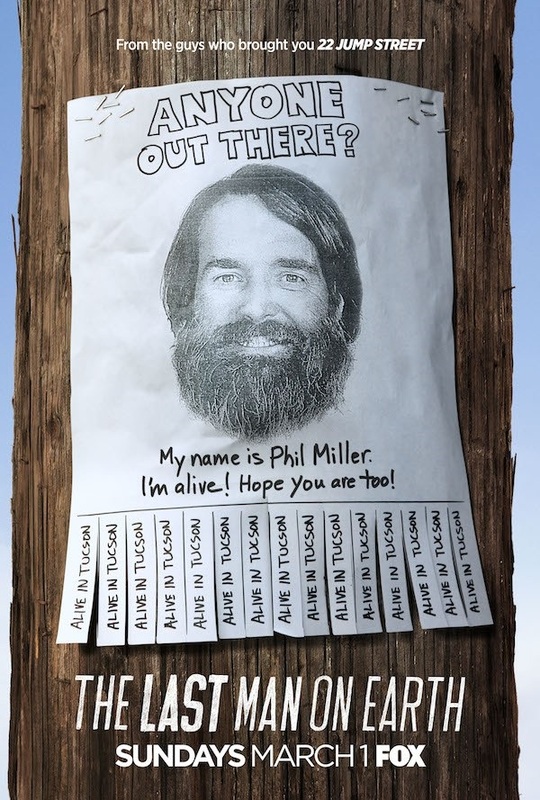 He’s the last man on Earth, but Forte isn’t the only actor in the show. He’ll be joined in some unknown capacity by January Jones (Mad Men), Kristen Schaal (30 Rock), Mel Rodriguez (Getting On) and Cleopatra Coleman (Step Up: Revolution). I can’t wait to see where they all fit into the story. The Last Man on Earth is set to premiere on Sunday, March 1, with back-to-back episodes. I’m already waiting for the comic book crossover with 28 Days Later.